Fantasino Casino | €700 Bonus and 100 Free Spins | Free Play Games! 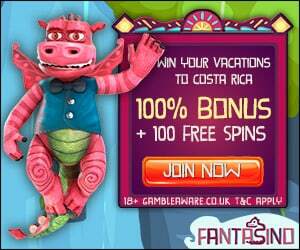 Home » Fantasino Casino | €700 Bonus and 100 Free Spins | Free Play Games! Fantasino Casino is a brand new casino, established in 2017, and is a product of EveryMatrix. They have a fantastical theme and have created a new concept with a host of lovable animated characters – Kingslot the king, Ace the dragon, Brolor the faun, and Chesty the leprechaun. The interesting thing about Fantasino is that it’s set up like a video game. There’s an avatar that you can personalize by buying tokens or playing games, or you can build your own fantasy world. Fantasino online is licensed in the UK, Malta, and Curacao, and the unique theme have our attention. The website and user interface are easy to use, and really, this casino brings a lot to the table. Here we take a closer look so we can see what exactly makes Fantasino tick. The first, and arguably the most important thing, is the Fantasino welcome bonus, which is spread out over a generous four deposits. The first deposit is matched at 100% up to €100, plus 100 free spins in Starburst. The free spins are spread out over the first five days on the site, so you get 20 spins a day. The second deposit is matched 50% up to €150, and the third deposit is matched at 50% up to €200. The fourth and final deposit is matched at 25% up to €250. In total, you can grab up to €700 free money and 100 extra spins! On top of that, it seems as though you’re constantly being rewarded, either with avatar accessories or free spins, deposit bonuses, etc. There are also prize draws every three months to an All-Included Vacations to Costa Rica, where tickets are achieved by depositing. Software providers for the site include NetEnt, Evolution Gaming, Playson, NYX, and more. Some of the biggest gamemakers are featured here, giving you a huge selection of games to choose from. There are over 1,000 casino games available to play, including ever-popular slots, table games, live casino, and video poker. You will be able to play casino classic like baccarat, blackjack, and roulette. They even have major jackpot slot games as well, including Hall of Gods, Mega Moolah, Mega Fortune and many other progressive jackpot slots. It is literally impossible to get bored here. You won't find a bigger game selection anywhere online. Fantasino Casino offers 24/7 customer service in three languages – English, Spanish, and French. They can be can be contacted through phone (for UK customers only), live chat, and email. The team is actually located in Costa Rica, and is knowledgeable, skilled, and friendly. Fantasino mobile casino works like a charm, and is incredibly user friendly even on the go. This is great for a casino in this busy day and age, when everyone wants their games everywhere they go. We found the mobile flash casino extremely easy to use, although we will say it comes up better on chrome than other browsers. Most of the same games are available, and you can play instantly from Android and iOS devices. Overall, this Fantasino Casino review has found that this casino is quite simply magical. With a cast of characters that you just have to fall in love with, the high level of customization, the great games, the large amount of bankroll management options, it really just seems that Fantasino has everything. This is one casino that you just don’t want to miss!